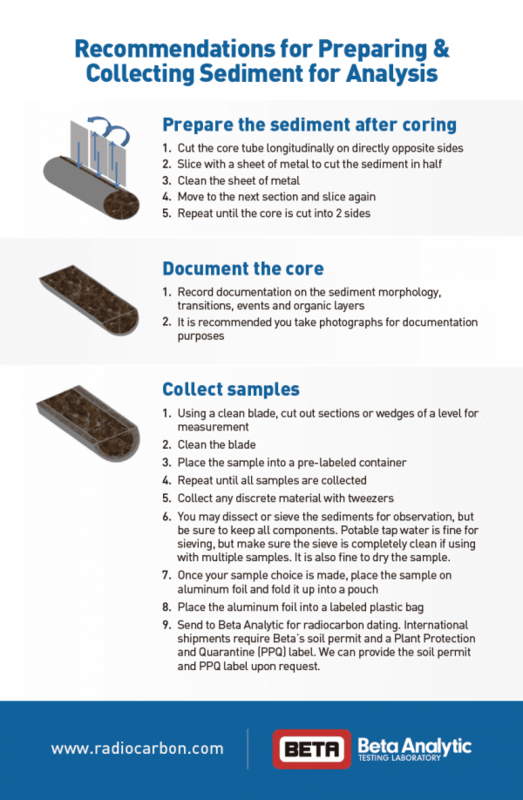 It is best to consult the Beta Analytic lab before submitting sediment samples. Pretreatment – Sediments are complex systems containing carbon of multiple forms, sizes ranges and sources. Please contact us to discuss the nature of your research objective to ensure the most appropriate pretreatment of your sediment sample. You are welcome to contact us to discuss the pretreatment or request that we contact you after the pretreatment to discuss options for radiocarbon dating. Wet Samples – There is no need to dry the sample. However, knowing the dry weight will better allow you to estimate the amount of material to send. If you want to dry your samples, heating at 90°C to 100°C for 4-24 hours is recommended. Sending wet or frozen samples for radiocarbon dating is fine. The lab starts the analyses immediately upon arrival of the sample so moisture will not induce contamination. Please remove excess water, wrap the samples with plastic (e.g. Saran Wrap) to limit air contact, place them in a Ziplock bag, and ship to us. Macrofossils – Due to complex soil geochemistry, it may be better to date extracted macrofossils in some circumstances. In the absence of macrofossils, radiocarbon dating can be done on sediment bulk organic fraction, humic fraction, or humin fraction. Reporting – If the macrofossils are chosen for the analysis, the reported results will be as “plant material”. If the sediment is chosen for the analysis, the reported results will be as “bulk organic carbon” or “total acid insoluble organics” depending on the sediment fractions included in the analysis. Macrofossil Identification – Beta Analytic does not offer identification services at this time. Dating the “Bulk Organic Fraction” – The sample dated is the organic fraction that remains after sieving the sediment to < 180 microns to remove any roots or macrofossils and then acid washed to remove carbonates. Dating the “Alkali-Soluble Fraction” or Humic Acid Fraction – The sediment is sieved to < 180 microns to remove any roots or macrofossils. It is acid washed to remove carbonates then treated with alkali to solubolize the humic acids which are then precipitated for AMS dating. Dating the “Alkali-Insoluble Fraction” or the Humin Fraction – The sediment is sieved to < 180 microns to remove any roots or macrofossils. It is acid washed to remove carbonates then treated with alkali to solubolize the humic acids which are rinsed away. The remaining alkali-insoluble fraction is dated. For sediment samples, the lab performs flotation in water then progressive sieving through 225-micron, 180-micron, and then 125-micron sieves to see if there are any macrofossils that can be extracted. Examples of these macrofossils include charcoal, wood, plant, bone, shell, and seeds. Note: Our lab does not identify the exact type of macrofossil found in the sediment. Identification of macrofossils requires highly trained scientists, e.g. paleobotanist for plants, forensic archaeologist for bones, or paleontologists for shells. Generally, it is better to date the macrofossils present than the sediment due to the possible contaminants in the latter. Most macrofossils can be treated with (1) acid to remove carbonates, and (2) alkali to remove humic acids that might be in the sediment. Humic acids come from the decay of plants. 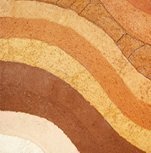 Sediment and rain water or ground water can move these humic acids up or down through the sedimentary profile bringing carbon that is either younger or older into a sediment layer. In most cases, humic acids travel downward and make the underlying sediment appear to be younger (sometimes by a small amount, sometimes by a large amount of bias). This is mostly true for sediments that are organic rich (dark black or brown in coloration) as well as for sediments that are not well drained and where water ponds (like swamps, peat bogs, etc). In areas where there is not much rain fall or the sediment is well drained or is low in carbon (light tan or gray sediments), humic acids may not be much of a problem. For such sediment samples, when you date both the sediment and some plant material that is found in the sediment, the dates are usually very similar thus sometimes there is really no humic acid problem to worry about. (2) the sediment was getting some or all of its carbon during its formation from an older source (reworking or redeposition of already deposited sediment from upslope due to flooding, mass movements or other physical processes). In general the plant dates are usually more reliable as they typically represent a more unique event in time. The plants were relatively short-lived as compared to the time it may have taken for the sediment to form. Dating the CaCO3 fraction of sediments is often done, but it can be problematic if the origin of the carbonate in the sediment is not well understood. Carbonate in sediments can come from the natural development of carbonate nodules in the sediment (called pedogenic carbonates) or from the movement of carbonates that are dissolved out of geologic formations (like limestone, marl and other carbonate bearing minerals) which are then redeposited into the sediment. Sediment geochemistry is very complex and can change from area to area even over small distances. Usually it is recommended to date the macrofossils that are found whenever possible, provided the researcher thinks that the macrofossils are “in-situ” and did not grow from the overlying layers (like roots). If macrofossils are found, the lab will inform the researchers and they can decide if they want to date the macrofossils or sediment. In some cases, it is wise to date both separately to see if the macrofossils or sediment is yielding the best (most reliable) date. This can be useful information if a large core or sequence of cores are being dated. Sediments that are treated with alkali to extract humic acids (and then dated on the humic acid or humin fraction) can sometimes yield problematic results depending on the localized soil geochemistry. Alkali extractions on sediments will remove any unbound carbon that is alkali-soluble. The source of this carbon can be from more recent humic and fulvic acids or ancient labile carbon that is alkali-soluble. Many times, depending on the clay concentration and if the younger or older humic/fulvic acids are bound to clay particles, the alkali extractions may preferentially remove the original or older labile carbon and leave behind the younger clay-bound humic and fulvic acids, or vice versa. Researchers sometimes assume that by performing an alkali extraction, the age of the sediment should always become older and therefore more accurate. However, many times what happens is the opposite; the alkali-extracted sediment yields a younger date due to the factors above. When alkali extractions and dating on either the humic or humin fractions or sediments are requested, the lab recommends that the researcher considers getting three dates for at least one sample prior to dating a larger number of samples, provided all of the samples submitted are from the same unique depositional area and geochemistry. Suggested three dates – 1 date on the acid washed and sieved Bulk Organic Fraction, 1 date on the Alkali-Soluble or Humic Acid Fraction, and 1 date on the Alkali-Insoluble or Humin Fraction. By having all 3 dates, a researcher can compare the results and see if one fraction or the other makes more sense and then use that as a guide to dating the other sediment samples in that area. If this is not financially possible or if the researcher has previously dated sediments in the area of collection on either the humic or humin fractions, these 3 dates may not be necessary. It is up to the researchers to determine what is best for their research. The Beta Analytic lab has analyzed thousands of sediment dates per year, and almost all of them are on the acid-washed and sieved bulk organic fraction. Only a very small percentage (1-2% at most) are dated by request on the alkali-insoluble/soluble fractions. Typically the acid-washed and sieved bulk organic fraction will yield the most accurate date or a date somewhat more recent if there are more recent mobilized humic acids present. The error (if any) is always in one direction and usually not yielding an age that is too old one time and too recent in the next analysis. Sediment Samples Disposal – Sediment samples received from foreign countries as well as many US States must be handled in accordance with the guidelines established by the US Department of Agriculture, Animal and Plant Health Inspection Service (APHIS). These guidelines require that sediment samples imported are treated either chemically or by heat on receipt and that they are eventually disposed by incineration. As such, the sediment samples received at our laboratory will be disposed in this manner, and we unfortunately cannot return them. We recommend that only as much sediment as needed for the analysis be sent. We can help advise as to how much may be required, but in all cases the amount sent should never exceed 200 grams. Please note that most organic sediment samples sent for AMS dating require only 2-4 grams or less depending on the carbon content.